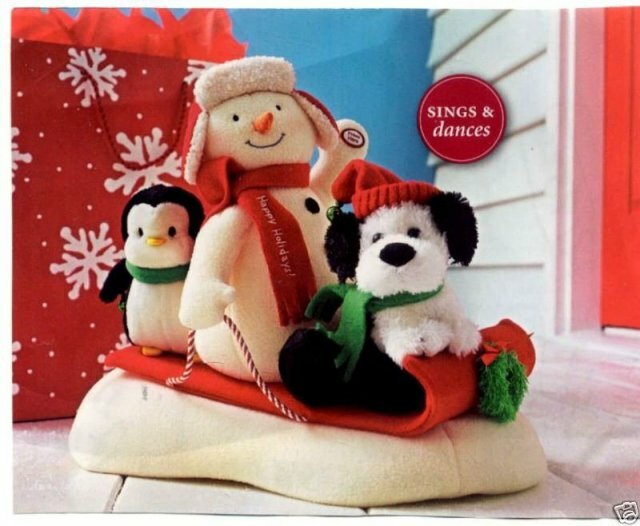 LISTEN TO THE SNOWMAN SING "SLEIGH RIDE" WHILE THE PENGUIN AND PUPPY JOIN IN JINGLING THEIR BELLS. Penguin shakes his body & the dog barks. ALL 3 PLUSH CHARACTERS MOVE. Batreries included. Wonderful table decoration to enjoy for years to come! New with tags, Mint condition, Never used. Items Similar To "SNOW WHAT FUN SLEDDERS~Animated Plush~Christmas Display~Hallmark ..."